The U.S. State Department ordered nonessential personnel to leave Venezuela, but is not closing its embassy in Caracas, the department said Thursday. On Wednesday, Venezuela's disputed president Nicolas Maduro said he was ending diplomatic relations with the United States in response to President Donald Trump's announcement that the U.S. was officially recognizing National Assembly President Juan Guaido as Venezuela's interim leader. Maduro ordered U.S. diplomats to leave within 72 hours. U.S. Secretary of State Mike Pompeo, however, said Maduro no longer has the authority to do so. Venezuela's President Nicolas Maduro gestures during a ceremony to mark the opening of the judicial year at the Supreme Court of Justice (TSJ), in Caracas, Venezuela, Jan. 24, 2019. The U.S. State department said it was evacuating non-emergency staff for security reasons, and that U.S. citizens should "strongly consider" leaving the country. The international dispute over the country's leadership appeared to deepen Thursday, with China and Russia voicing support for Maduro's embattled government. Russia's deputy foreign minister warned the United States that the Kremlin continues to back Maduro and the principle of non-interference in Venezuela's domestic affairs. Pompeo, in his remarks to the Organization of American States (OAS) on Thursday, urged all members to recognize Guaido as Venezuela's leader and pledge support for Venezuela's democratic transition. "All OAS member states must align themselves with democracy and respect for the rule of law," said the top U.S. diplomat. "All member states who have committed to uphold the Inter-American Democratic Charter must now recognize the interim president. The time for debate is done. The regime of former President Nicolas Maduro is illegitimate. His regime is morally bankrupt, economically incompetent and it is profoundly corrupt. It is undemocratic to the core," added Pompeo. Guaido, the president of Venezuela's National Assembly, declared himself interim president during a day of mass demonstrations a day earlier. On Thursday, Venezuelan Defense Minister Vladimir Padrino allied with Maduro, calling him the country's "legitimate president" and disavowing Guaido's declaration as the leader. Padrino said the opposition was carrying out a coup. At the OAS, Pompeo warned of any violence against Venezuelan people by security forces, calling the military to support democracy and protect the citizens. The chief American diplomat announced the U.S. would provide more than $20 million in humanitarian assistance to Venezuela, funding food supplies and relieving the dire impact caused by the economic crisis. Trump bluntly warned Maduro that "all options are on the table" if there is not a peaceful transition to democracy in the South American country. White House officials emphasized that Trump is not ruling out any response, such as a naval blockade or other military action, if Maduro unleashes violence against protesters or takes action against Guaido. The most immediate action by Washington likely would be enhanced sanctions against members of Maduro's government. "In our sanctions, we've barely scratched the surface on what actions the United States can take," said a senior administration official. Several nations have joined the U.S. in recognizing Guaido as Venezuela's interim president, including Canada and 11 of the 14 members of the newly formed Lima Group of Latin nations, among them Argentina, Brazil, Chile, Colombia, Costa Rica, Guatemala and Peru. Opposition supporters take part in a rally against Venezuelan President Nicolas Maduro's government in Caracas, Venezuela, Jan. 23, 2019. ​French President Emmanuel Macron called Venezuela's elections "illegitimate" in a tweet Thursday, and saluted the bravery of Venezuelans demanding freedom. United Nations Secretary-General Antonio Guterres warned Thursday the situation in Venezuela could descend into "disaster" if the country's main political rivals fail to reach an agreement. Speaking Thursday at the World Economic Forum in Davos, Guterres said the U.N. hopes "dialogue can be possible, and that we avoid an escalation that would lead to the kind of conflict that would be a disaster" for the people of Venezuela and the region. 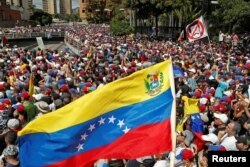 But officials in Russia, one of Venezuela's biggest allies, reacted with anger Thursday at the United States and other Western nations for backing Guaido, accusing them of interfering in its internal affairs. Russia's Foreign Ministry warned the United States against any military intervention, saying such a move would have "catastrophic" consequences. 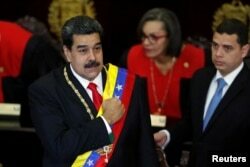 Bolivia, Cuba, Iran and Syria also have issued statements throwing their support behind Maduro. The three member nations of the Lima Group that have not supported Guaido are Guyana, Saint Lucia and Mexico. "From a constitutional, humanitarian, and democratic perspective — and according to international law — there was no option left for the United States and the international community but to recognize Juan Guaido as the interim president of Venezuela," Moises Rendon, associate director and associate fellow of the CSIS Americas Program, told VOA. Venezuela and its state-owned oil company, PDVSA, are estimated to owe $7 billion on a combined trade debt of about $60 billion. The country's oil-based economy, which is wracked by hyperinflation, has collapsed.